* Output: Continuous 45A, Burst 50A up to 15 Secs. * Input Voltage: 2-6 cells lithium battery or 5-18 cells NiCd/NIMh battery. * BEC: 3A / 5V (Switch mode). 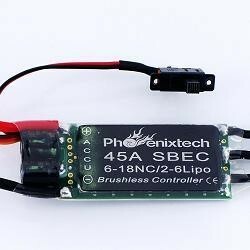 Designed for use with brushless motors, the latest Phoenixtech Elite Series of sensorless speed controllers offer a feature set that makes them hard to beat. The ESC's offer high quality construction and manufacturing, efficient operation and design, and full programmability. Lipoly compatible voltage cutoff settings with cell count auto-detect, beefy BEC (battery elimination circuit), and a great price make the Phoenixtech Elite Series an excellent choice.